2.60/40 Portfolio Breaks to New Highs. 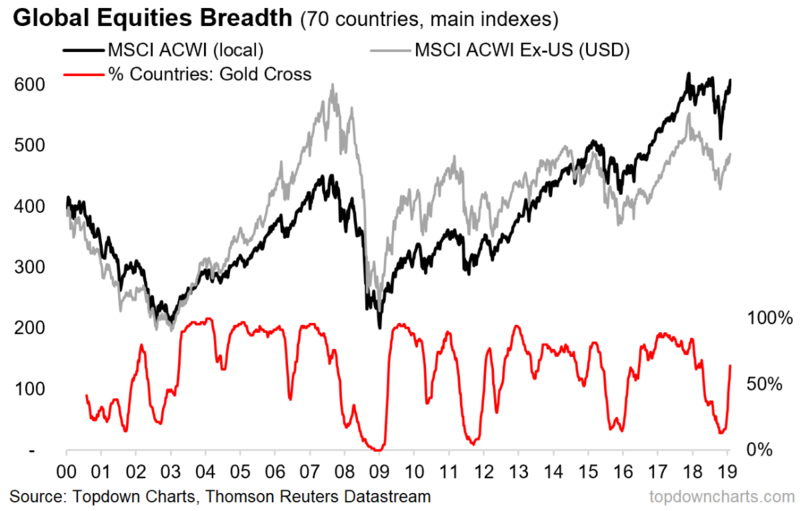 3.81% of Emerging Market Countries 50 day thru 200 day to Upside. 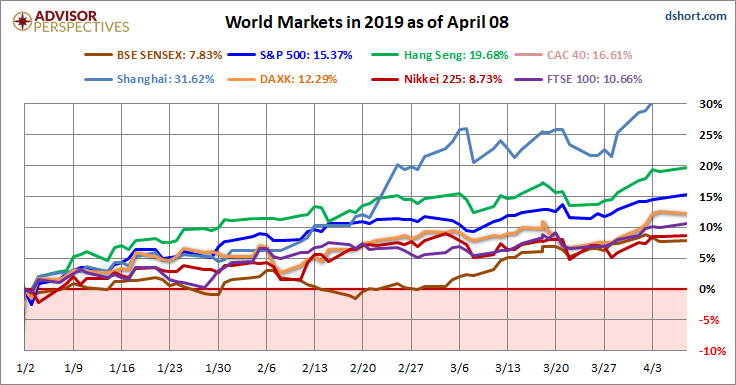 All eight indexes on our world watch list posted gains through April 8, 2019. 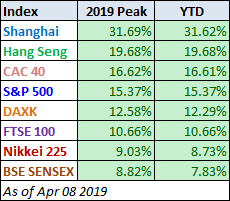 The top performer is the Shanghai SSE with a 61.62% gain and in second is Hong Kong’s Hang Seng with a gain of 19.68%. In third is France’s CAC 40 with a gain of 16.61%. Coming in last is Tokyo’s Nikkei 225 with a gain of 7.83%. 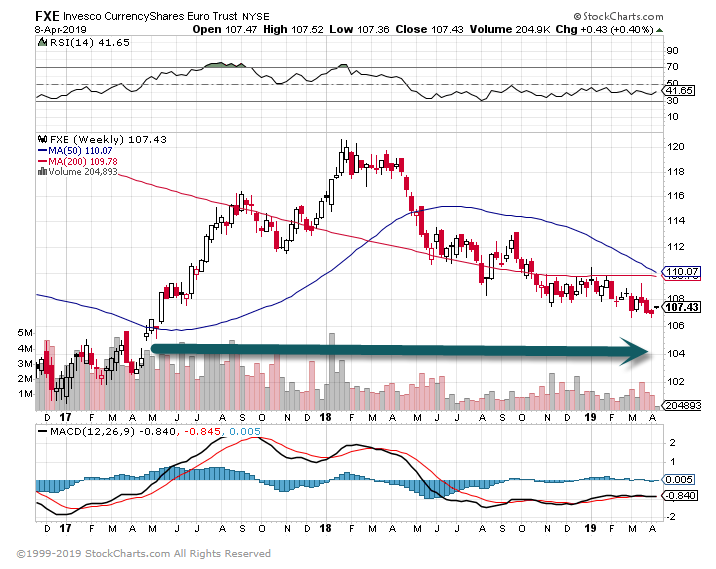 Euro currency sinking ..helping exports? 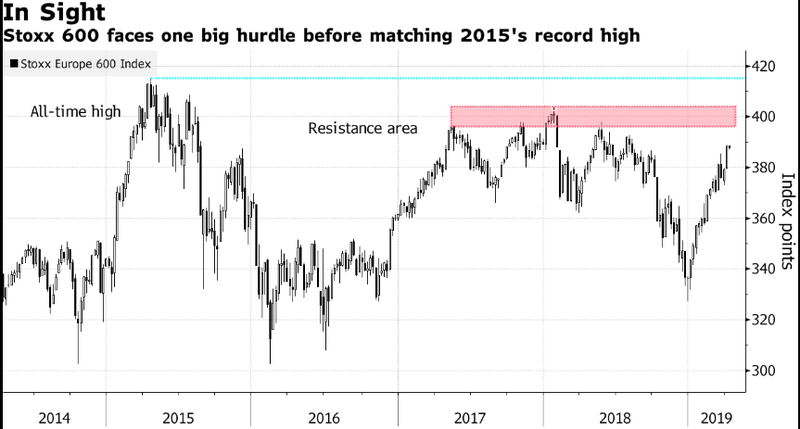 Stoxx 600 Watch for Breakout. 6.When Wages and Unemployment Converge? When Vivian Young and her then-husband took their first vacation without the kids, the need for estate planning struck them like a jolt. More than half of Americans will learn those consequences first hand, as only 42 percent have a will or other estate planning documents, according to a 2017 Caring.com study. Among parents of children under 18, only 36 percent have created a will. But if you die without a will, your state’s laws will determine what happens to your property or who should be legally responsible for minor children. That might be OK in some situations, but in others, a grandchild with special needs might not get the resources you want him to have, or an estranged family member might get possession of your house. “What people get wrong is thinking that if they don’t do anything, things will work out,” says John Terrill II, incoming president of the American College of Trust and Estate Counsel, an organization of estate planning attorneys. When Joy Loverde, 67, and David Schultz, 74, of Chicago married in 1999, they realized that they had like-minded philosophies about money. However, Loverde, who writes about elder issues in her book, “Who Will Take Care of Me When I’m Old,” found that people often overlooked planning for hardships that can occur while they were still alive. A living will is a legal document that states what medical procedures you want or don’t want if you are incapacitated and can’t speak for yourself. This would be the go-to document if the question ever arises about whether to continue life-sustaining treatment. Durable powers of attorney are legal documents that let someone you appoint make legal, financial and health care decisions for you if you can’t do it. Some may benefit from establishing a trust, a legal entity that holds any property that you want to leave to your beneficiaries. With a trust, your family won’t have to go through the legal process of probate, where the court ensures that your assets are distributed and your debts are paid. Trusts also allow you to set up rules for how and when property is distributed. If you do this, you’ll need to identify a trustee who will manage the trust. If you have investment accounts and retirement plans such as a 401(k), make sure the person you have listed as the beneficiary is the person you want to receive those funds. Even if your will says otherwise, the beneficiaries listed on the account will inherit the money. Your plan will likely change as your life evolves. “I was an attorney myself but didn’t handle that kind of legal situation, so knowing what you know and knowing what you don’t know is pretty important,” Schultz says. What to do when your energy and focus take a nosedive after lunch. You know the feeling: It’s 2 p.m. at the office, and you have a ton of work to finish up before heading home. But the only thing you really feel like doing is curling up in a quiet corner and falling asleep. This afternoon drop in energy and focus can lead to careless mistakes and lost productivity at work. If your energy level is falling off a cliff every afternoon, here’s how to pick it up again. The urge to sleep naturally waxes and wanes at certain times of day. According to the National Sleep Foundation, it’s generally strongest between 2 and 4 a.m., which is convenient for most people, and between 1 and 3 p.m., which is decidedly not. To the extent that you can, schedule your work activities around your natural highs and lows in alertness. People typically experience a peak in alertnessaround 8 to 9 a.m., so that’s often an excellent time to tackle the most cognitively demanding and detail-oriented tasks. If you save such tasks for the early afternoon, be aware that you may not be operating at 100% efficiency. Avoid loading up on refined carbs and sugar. They can cause a sudden spike in blood sugar that gives you a quick pick-me-up, followed shortly by a crash that leaves you tired and hungry. To stay energized and feeling full for longer, build your lunch around high-quality protein combined with fiber-rich whole grains, vegetables, and fruits. Include some healthy, unsaturated fat. In one study, overweight adults were randomly assigned to eat lunches containing either almonds or extra refined carbs (such as white bread) for three months. The meals contained the same number of calories, but the almond-enriched lunches provided more fiber and “good” fat. In both groups, memory test scores dropped about a half hour after eating. But the decline was lessened in the almond group, likely thanks to the mix of lower carbs, higher fiber, and healthy fat. Pay attention to your calorie intake as well. Research has confirmed what anyone who ever supersized a meal already knew: Drowsiness is a bigger problem after a heavy meal than a light one. If you’re struggling to keep your eyes open, taking a nap seems like the obvious solution. Indeed, research has shown that a short nap can reduce drowsiness and may help combat an afternoon slump in certain cognitiveabilities. For example, one study showed that nappers experienced less decline in cognitive flexibility—the ability to switch their thinking quickly from one thing to another—compared to those who didn’t nap. The ideal length for a workplace nap is 20 minutes or less. Longer naps can cause sleep inertia—a sense of grogginess that may linger for several minutes after awakening. If your boss objects to snoozing on the clock, point out that a growing number of companies—such as Nike, Google, and Ben & Jerry’s—have already adopted nap-friendly policies. Walk down the hall, up and down the stairs, or around the block. Do some jumping jacks or wall pushups. Use a jump rope or set of hand weights that you keep stashed in your desk. Run through a yoga or tai chi sequence. Doing something physically active is a great way to revive flagging energy and engagement. If you can step outside and stroll among trees and flowers, your focus and mood may get an added lift. But even if you simply stroll among the cubicles, research shows that moving around may help you feel less bored and sluggish. Exposure to bright light gives your sleepy brain a wake-up call. In one study, participants wore special glasses, which emitted either bright blue light or dim orange light, for 30 minutes after lunch. The results showed that the early-afternoon dip in cognitive flexibility was diminished in the group wearing bright-light glasses. Typical office lighting is around 500 lux (a unit of illumination). The bright-light glasses used in the study were four times brighter (2,000 lux), and many light therapy boxes are 20 times brighter (10,000 lux). If you’re thinking about trying a bright-light device, ask your health care provider for guidance on how to safely maximize the benefits. Of course, you could also simply pop outside to enjoy the sunshine on your break. The change of scenery, especially if it offers a glimpse of nature, may give your brain the extra boost it needs to power through the rest of your day.